Madonna's new DKNY line finds a new face with Rita Ora. 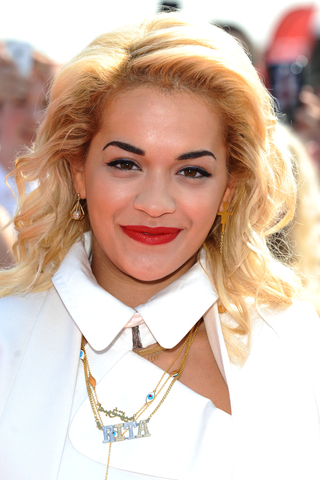 Rita Ora is now Madonna’s new Material Girl. The 22-year-old British singer Rita Ora is now the new face of Madonna’s Material Girl line for DKNY. Her recent shoot was shot in the bright, luminous, fashionably and lively known Times Square in New York City. The face of DKNY used to be Cara Delevingne, Ora’s best friend – or “wifey,” as she calls her. However, there are no harsh feelings between the two beautiful fashion-keen ladies, as the New York Post describes. They seem to share a pretty good relationship, as they have hit the red carpet before, side-by-side after the new agreement. However, to proceed with Rita Ora’s fashion updates, Material Girl is run by Madonna and her 16-year-old daughter, Lourdes. She was called by Madonna herself and signed the approximately $800,000 deal with the new brand. Aside from replacing her best friend Delevingne, Ora will also replace Georgia Jagger in the brand’s upcoming campaign. Ora absolutely loves and lives in fashion, right along with her music. Ora is also the face of the Italian sneaker brand Superga. She is the first artist to model DKNY, rather than DKNY jeans. For a little extra information on the brand itself, DKNY was launched in 1988 as a line for younger women at a less expensive price, in addition to the head designer’s “Donna Karan New York” line. Donna Karan, the head designer, then created DKNY jeans. DKNY clothes, as well as Material Girl, can be found in the number one department store in the Unites States, Macy’s. Material Girl is also intended for younger women, and there is certainly style for everyone. Be sure to cop the latest trends of this clothing line. You too can be a Material Girl just like Madonna.